1. Determine if you're running 32 bit Windows or 64 bit Windows before selecting a download link. From the Start Button choose Run... and then enter the command "System" in the dialog box that opens up. 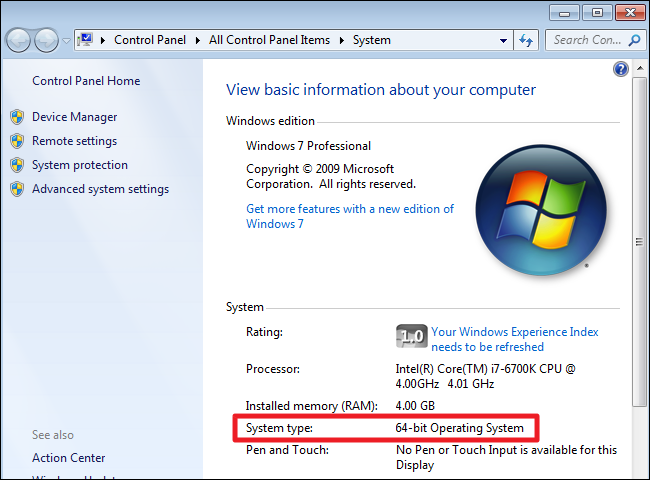 You'll be shown a screen showing whether you are running 32 bit or 64 bit Windows. Click on the Start Button, then right-click on Run... and then enter the command "System" in the dialog box that opens up. You'll be shown a screen showing whether you are running 32 bit or 64 bit Windows. Locate the file after you have downloaded it from the link above launch it. Double-Click on it and choose Run. Then you will see the “Install screen” click Install. After the installation is complete you will see the “Finish screen” click on Finish. Double-Click on the Icon to launch FortiClient. Then enter your Queens username and password. Click Connect after entering your information. After you have entered your username and password correctly your System Tray icon will indicate a successful VPN Connection. You now have a secure connection to the Queens network. When you are ready to disconnect, you can double-click on the System Tray icon. It will show you session information. Click the Disconnect button.